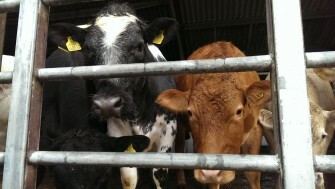 Cows waiting in pens before being auctioned. The second of three recordings (the others are sorting sheep here and a sheep auction here). As well as sheep, there were some cows in pens waiting to be auctioned. The cattle auction took place a couple of hours after the sheep auction. In this recording the cows are just milling about and being inquisitive of the microphone (see photograph). Number ..2637 was particularly interested in my activities.